We’d love your help. Let us know what’s wrong with this preview of You Mean I'm Not Lazy, Stupid or Crazy?! by Kate Kelly. 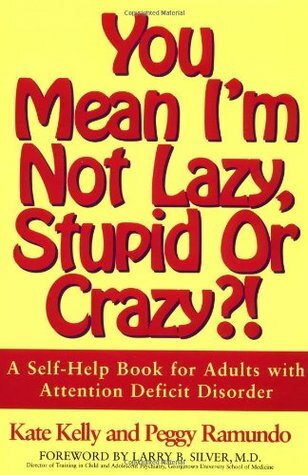 With "You Mean I'm Not Lazy, Stupid or Crazy? !, " Kelly and Ramundo bring together their considerable personal and professional experiences to create the essential guide to identifying, understanding and managing the dynamics of ADD in adults. To ask other readers questions about You Mean I'm Not Lazy, Stupid or Crazy? !, please sign up. Be the first to ask a question about You Mean I'm Not Lazy, Stupid or Crazy?! Questions, The Answers To Which Have Already Been Obtained By Bill Gates On His International Travels? Thanks. This is all I can say to these authors. Talk about pick a book up, and suddenly understand your whole life. And yes, I did think that, and yes, I have since been tested ADHD positive, at my ripe old age of 44. Never even knew such a thing existed in Adults. The discovery and the journey of self understanding, forgiveness and learning new ways to live, have been utterly life changing and amazing. Wow, I really wasn't lazy, crazy or stupid! Very cool. Kind of ironically, I'm going to call this one too scattered. I get that when they started, this was a work by not-so-professionals trying to get the word out when zero other material existed on the market, so they tried to cover absolutely everything. However: SO many anecdotes thrown in for a paragraph at a time and then referred to 300 pages later, so many that you kind of lose track of anything so many different types of "ADDers" are actually supposed to have in common with each other. So man Kind of ironically, I'm going to call this one too scattered. I get that when they started, this was a work by not-so-professionals trying to get the word out when zero other material existed on the market, so they tried to cover absolutely everything. However: SO many anecdotes thrown in for a paragraph at a time and then referred to 300 pages later, so many that you kind of lose track of anything so many different types of "ADDers" are actually supposed to have in common with each other. So many different angles at trying to boost one's self-esteem that don't all match up with each other. And so many different kinds of listmaking that they seem to suggest you do all at once (thus overwhelming the easily-overwhelmed ADHD types!). All that said, some very valuable nuggets of gold for the newly diagnosed or the probably-about-to-be-diagnosed. (money line here:) I think the string of quotations I scribble into my commonplace book are going to be infinitely more valuable than this book as I experienced it in real time. It's the first book I read on ADD so I guess the initial favourable impression was just a kind of 'ah, at last I am not alone' kind of recognition. However, I've liked it less as time passes. It is badly organised and set out with far too many exclamation marks and EMPHASIS!!! It's a real 'victim' book. One thing that is good is that it outlines the various 'sub-types' of ADDers - ADD symptoms manifest themselves in different kinds of behaviours among different types of people. It's not just cra It's the first book I read on ADD so I guess the initial favourable impression was just a kind of 'ah, at last I am not alone' kind of recognition. However, I've liked it less as time passes. It is badly organised and set out with far too many exclamation marks and EMPHASIS!!! It's a real 'victim' book. One thing that is good is that it outlines the various 'sub-types' of ADDers - ADD symptoms manifest themselves in different kinds of behaviours among different types of people. It's not just crazy tartrezine-fueled kids running around causing chaos. But to some extent aren't these just strategies that all adults use to get stuff done and keep sane? SCHEDULE! Time track. Use notebooks to record everything (Evernote is the greatest invention in the world). Keep a routine. Make room for quiet time. Get enough sleep. Find balance (still one I have trouble with). What I actually wanted the book for - strategies for working with a co-worker with ADD - not actually so useful, because the focus is on developing personal self-management routines, rather than things I can do in the workplace to make life easier for them and make us productive when working together. So much is variable that I'm going to have to ask them what they prefer (but not over the telephone! So that was one good tip). I can't judge how good this book would be for the target market, but it seems really comprehensive, I liked the authors' writing style, and I enjoyed reading it. I think this would also work for people who are just temporarily overwhelmed with stuff, and not only for people with ADD. Finally, I'm not alone. For years I thought I was crazy. I thought if I tell anyone what its like inside my head, surely they'll have me committed. So I kept quiet. It wasn't until my kids were diagnosed with ADHD and my daughter explained to me what its like in her head, that I realized I had ADD. I still wasn't sure what that meant, so I went looking for books. The title of this one immediately caught my attention, but I was sure the information contained inside couldn't possibly live up to th Finally, I'm not alone. For years I thought I was crazy. I thought if I tell anyone what its like inside my head, surely they'll have me committed. So I kept quiet. It wasn't until my kids were diagnosed with ADHD and my daughter explained to me what its like in her head, that I realized I had ADD. I still wasn't sure what that meant, so I went looking for books. The title of this one immediately caught my attention, but I was sure the information contained inside couldn't possibly live up to the title that I so easily related to. I was wrong. This book has been a savior, in a head that is constantly cluttered, streaming, and screaming for peace, now I know I'm not alone. I know I can manage what sometimes feels like an uphill battle, in 10 feet of snow, without my shoes on. Starting right from the awkward title, this book is showing its age. Written back in the nineties (when it was apparently the only ADD book) it tries to cover all the conceivable angles of the ADD life in one dense tome. It's text heavy, with narrow margins and clunky visual design, leavened only by some unattractive and often irrelevant cartoons. It's 2016 and you can now read books — or at least articles —about every conceivable concern for people with AD/HD: AD/HD in the workplace, AD/HD in th Starting right from the awkward title, this book is showing its age. Written back in the nineties (when it was apparently the only ADD book) it tries to cover all the conceivable angles of the ADD life in one dense tome. It's text heavy, with narrow margins and clunky visual design, leavened only by some unattractive and often irrelevant cartoons. It's 2016 and you can now read books — or at least articles —about every conceivable concern for people with AD/HD: AD/HD in the workplace, AD/HD in the bedroom, AD/HD for women, men, boys and girls, AD/HD on vacation, AD/HD and personal grooming, AD/HD and pets... I can keep going as long as I can think of things to Google. The book was well-organized and the voice was genuine. If I had read it when it was originally published years ago, I probably would have found it informative. Unfortunately, I was hoping to gain some insight into ADD for adults and I didn't learn anything that I didn't already know. I'd give it 2 stars because the Goodreads label says 2 stars= "It was okay," but that seems like a pretty low rating for a book that does have pertinent information despite not being helpful for me. It's been 19 years since I read this book but I know it helped me understand who I am and how my brain works. It was wonderful to read a book that made sense to me. I could totally relate! When you've spent most of your life either being told or believing you are lazy, crazy or stupid...it's a wonderful relief to know you are not alone. And no, I'm not Lazy, Crazy, or Stupid! This is not a book. It's a joke really. Looks like the author cut out an article or two from COSMOPOLITAN and then paid someone a few hundred dollars to increase the number of total words so she could have it published as a book. Utter waste of time (and money). Overall, I think this is a valuable resource for people trying to understand how either they or someone they love can be so many contradictory things at once. Scattered, but then hyperfocused on a new passion. How an intelligent person can be brillant in one moment, then unable to collect his/her thoughts enough to figure out what to make for dinner. As a professional, I recommend the book, although different people respond better than others. Some can soar through it, amazed by the insights int Overall, I think this is a valuable resource for people trying to understand how either they or someone they love can be so many contradictory things at once. Scattered, but then hyperfocused on a new passion. How an intelligent person can be brillant in one moment, then unable to collect his/her thoughts enough to figure out what to make for dinner. OMG! This is the BEST book ever for anyone with ADD/ADHD! And especially for those with ADD who have been reading self-help books for years, attempting to improve themselves. The authors cover everything associated with this disorder and give practical advice on dealing with everyday life; i.e. organization, sexual functioning, medication interactions, memory training, etc. Even if you are not personally affected with the disorder, you probably know a loved one or a friend who is and it will cer OMG! This is the BEST book ever for anyone with ADD/ADHD! And especially for those with ADD who have been reading self-help books for years, attempting to improve themselves. Even if you are not personally affected with the disorder, you probably know a loved one or a friend who is and it will certainly help you to better understand them and their idiosyncracies. Recommends it for: anyone who is dealing with ADD in themselves or others. The most helpful things about this book were the extensive case studies and examples of people and how ADD affected their lives in many different ways. I think also the drug sections and therapy possibilities were interesting and brief. However, the book could have benefited from some serious editing. And the strategies to help ADDers with organization and other areas where they need help were not well organized or nearly extensive enough. I really found this book to be helpful. This book taught me a lot about ADD and I found out that much of what I had been told about the condition when I was first diagnosed as a kid had been proven wrong. I also liked the simple, practical advice it provided. I absolutely love this book. It is one of the first that really spoke to my ADD issues. Anyone who thinks s/he has ADD/ADHD, anyone who knows s/he has ADD/ADHD, and anyone who is close, personally or professionally, with someone who has ADD/ADHD can benefit from this book. It's a great first step to understanding the possible symptoms and effects of the disorder. It's a great first step to admitting you might be affected by the disorder. It's a map for getting help and helping yourself. What makes it so valuable is the fact that it's written by two women who are themselves ADD-abled and who are now life coaches for those living with such differences. And it's real - these women aren't always waving pom-poms, claiming the work you'll have to do, the challenges you face, are not really a big deal. They admit the process of learning to truly live with ADD/ADHD can be frightening and hard. Bu they are convincing that the struggle is worthwhile. Another reviewer pointed out that the medical sections are outdated. That is a very practical and true observation. But the general point that someone with ADD/ADHD shouldn't automatically reject medication is nonetheless valid. Honestly . . ? Some things hit hard. And I thought it was because I was actually finding some sort of kinship with this book. But the more I read, the more I felt like the authors were just including everything in it—including all the contradictions between behaviour. It didn't give me any new revelations, and the coping strategies were meh. This book was recommended by my psychiatrist, and it really explains a lot. I've read it over multiple times, and have gone back for more, because it's just so full of helpful knowledge to learn to live with ADHD as an adult. You know the signs of a solid book when you have to continue pausing to think about implications and how things the back to your own life and behaviors. I've taken copious pages of notes and plan to re-read this book again to capture more ways to help myself and my ADHD. Either I don't have ADD or this book is awful. I'm not sure because I couldn't pay attention to the awful quality of the audiobook. It's a little on the wordy side, if I'm looking really hard for a complaint, but I have to think about it. There are great tips on treatment options that are remarkably unbiased compared to other things I've read, pointers for families (both planning and running), help on relationships and things to keep an eye out for or do differently, and it even ends on a 'pros to ADD.' Overall really useful and pleasant to boot. This was not the book for me- it is very basic basics. I am still looking for my 201 level book, but this not it. Really good book for people who have been diagnosed or have a loved one diagnosed with ADHD. Amazing resource with multiple options, not just medication. Highly recommended. Ironically (or not), I struggled to finish this. It was not laid out in a way that works with my ADHD, and it was written in a way that made it hard to work out what advice was being given. Insightful. Keeping this one around for me. This book was okay and I did find a few pearls of wisdom - but it wasn’t super helpful for the inattentive type of adhd, which is what I need advice and information on. There are some parts I glossed over but that's to be expected. This book helped me realize that I'm not alone, there are lots of us that understand the frustration and confusion that go with ADHD. I was in my early 40's when I was diagnosed nearly 20 years ago. I've known all my life that I was a different from other people but didn't know why. I was always busy, I couldn't keep my thoughts in one place, I'd go from one thing to the next at a moments notice. In school teachers would tell me I was dumb, stupid, I should be in special ed, etc. Problem was, This book helped me realize that I'm not alone, there are lots of us that understand the frustration and confusion that go with ADHD. I was in my early 40's when I was diagnosed nearly 20 years ago. I've known all my life that I was a different from other people but didn't know why. I was always busy, I couldn't keep my thoughts in one place, I'd go from one thing to the next at a moments notice. In school teachers would tell me I was dumb, stupid, I should be in special ed, etc. Problem was, I could do the work with no problem. I just couldn't stay focused on it. The ticking of the clock was enough to get me off track. How do you explain to your teacher that the kid in the front of the class is breathing too loudly, and you can't focus on what they're saying. I knew it sounded ridiculous so I kept my mouth shut and let people think what they wanted. As life turned out 3 of my 5 kids have ADHD. I didn't recognize it in them right away, I just saw happy, busy, energetic kids. But once they started school.....teachers started sending notes about getting my kids checked. It broke my heart. I didn't want them to go through what I had gone through. You know what? Life isn't so bad. I was able to give my kids suggestions on how to make life a little easier. Ways to calm down, what to do when you just can't seem to focus, and that feeling of always being totally disorganized. Kelly spelled everything out so perfectly just like she had been hiding in my head. I've had a few jobs and was recommended for raises after short periods of time. I've been hunted down to post for a job that I knew nothing about nor was I qualified for(they came to my house with the paperwork)yes I got it and was promoted. So having ADHD does have it's high points. Don't sell yourself short.